The Irishman is owned by Bernard and Rosemary Walsh in Carlow. The brand began life in 1999 with an Irish Coffee product followed by an Irish Cream Liqueur. In 2006 they completed a long-term supply agreement for whiskey from Irish Distillers and launched their first whiskey product in 2007. Jump forward to 2016 and the Walsh's have come along way. Their own distillery is nearing completion at Royal Oak in Carlow. 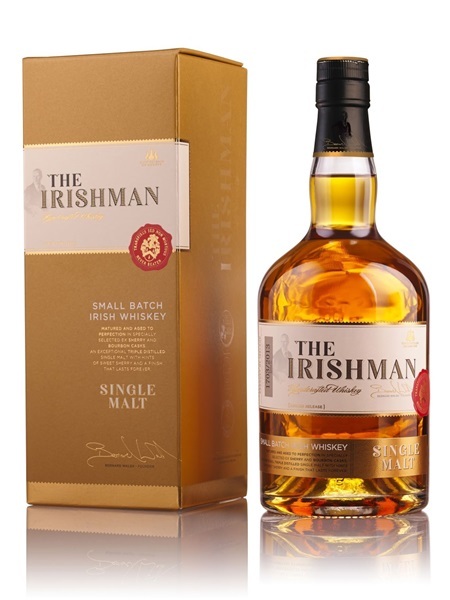 Their Irishman range of whiskeys includes a 12 year old single malt, a Founder's Reserve and a cask strength whiskey. This single malt (~€47) is a multi award winning, non-age statement, triple distilled single malt independently sourced in Ireland. It is aged in both ex-bourbon and sherry casks and bottled at 40% ABV.